The first part of this report looked at the size of the routing table as well as some projections of its growth for both IPv4 and IPv6. However, the scalability of BGP, as the Internet’s routing protocol, is not just dependent on the number of prefixes carried in the routing table. Dynamic routing updates are also part of this story. If the update rate of BGP is growing faster than we can deploy processing capability to match then the routing system will lose data, and at that point, the routing system will head into turgid instability. The second part of this report of BGP in 2018 will look at the profile of BGP updates across 2018 to assess whether the stability of the routing system, as measured by the level of BGP update activity, is changing. 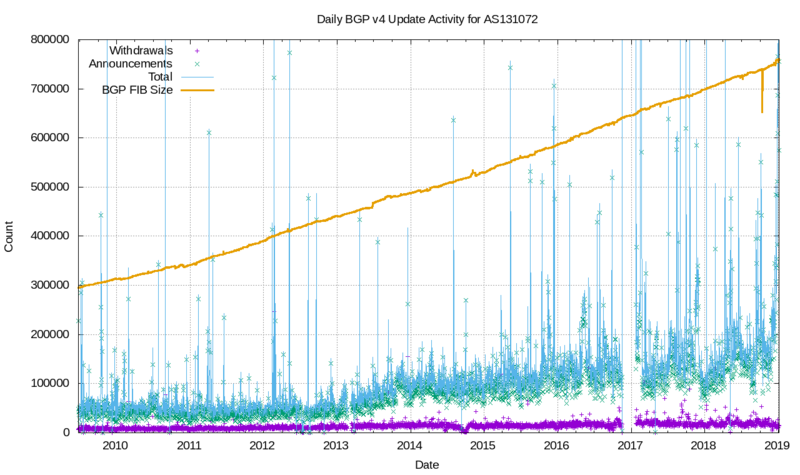 Figure 1 shows the daily BGP update activity, as seen at AS131072, since mid-2009. There is a lot going on in this plot, so let’s dive in and look at what is happening. Figure 1 – IPv4 BGP update counts. The first thing to highlight is the number of withdrawals per day (shown in violet). 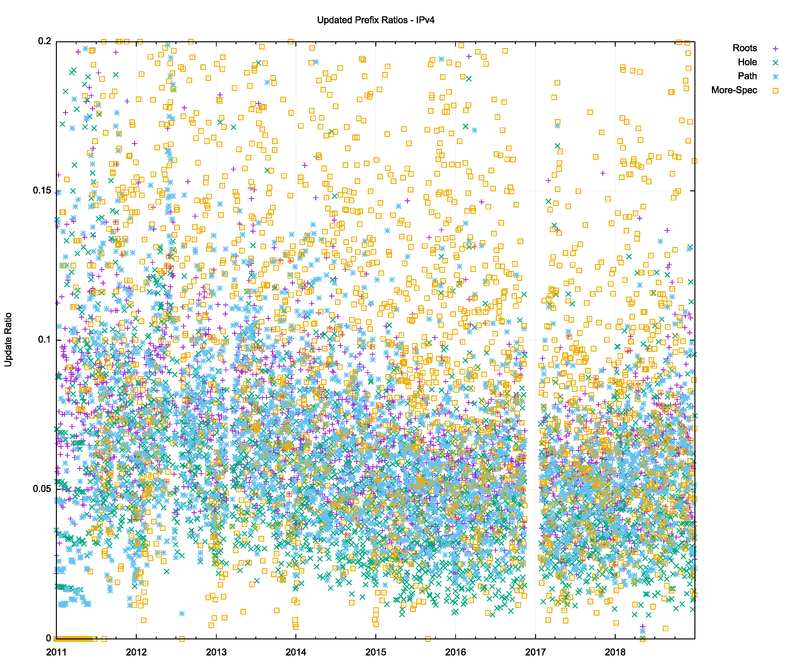 Since 2009, the number of advertised IPv4 prefixes has risen from 300,000 to 750,000 (shown in orange), yet the number of observed withdrawals has remained relatively constant at some 15,000–20,000 withdrawals per day. There is no particular reason why the withdrawal count has held steady while the number of announced prefixes has more than doubled. We have no explanation for this behaviour so far. It is puzzling why the route withdrawal rate has been relatively constant for such a long time. If withdrawals are a result of some form of link-based isolation event at the origin, then one would expect that as the number of networks increases the withdrawal volume would also increase proportionately. This is not the case. The withdrawal rate also appears to be unrelated to either the number of routed prefixes of the number of routed networks. 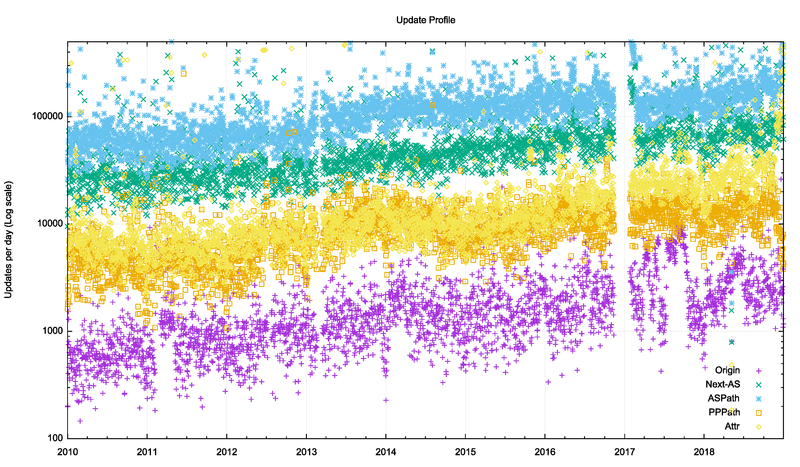 The second thing worth highlighting is the number of update messages per day (shown in green). This was steady at some 50,000 updates per day from 2009 until 2013. During 2013, the volume of updates doubled to some 100,000 updates per day, which it maintained for most of the ensuing 24 months. During 2016, the number of updates per day rose again, approaching some 170,000 updates per day by the end of 2017. This is not exactly reassuring news for the routing system. More worrisome is that the last few weeks of 2018 saw this update rate further increase up to 700,000 updates per day. It had been fortuitous that the BGP update rate has held steady for so many years, as this has implied that the capability of BGP systems has not required constantly increasing processing capability. In the same way that there was no clear understanding of why the BGP update rate was steady for so many years, it’s also unclear why the rate has started to increase in 2016 and continued to increase since. What is also intriguing is that most of these 170,000 updates per day are generated from a pool of between 30,000 to 70,000 prefixes. A plot of the daily number of different prefixes that are the subject of BGP updates is shown in Figure 2. 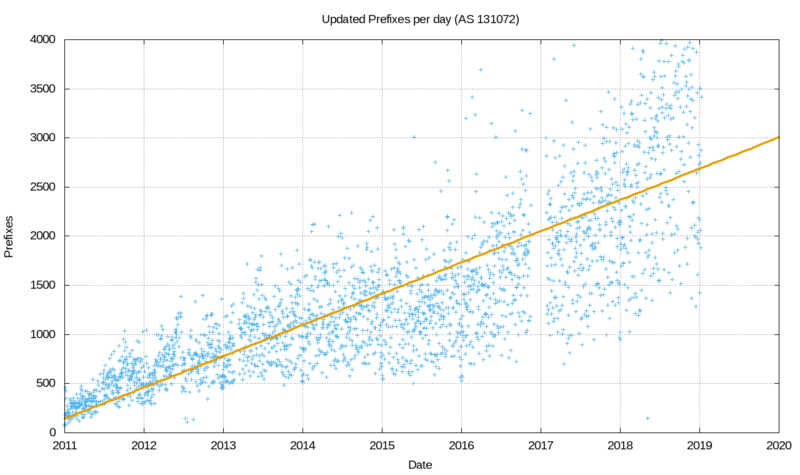 While this number is rising, it is not rising at the same rate as the number of updates per day, so the heightened instability is possibly due to more updates reaching convergence, rather than due to more unstable prefixes. Another possible explanation is that we are looking at daily average numbers and this rise in the average could be caused by a small pool of unstable prefixes exhibiting higher levels of instability than was the case previously. Figure 2 – IPv4 unstable prefixes per day. The number of unstable prefixes per day appears to have gradually increased over the years. A least-squares best fit shows a linear trend that increases the average daily unstable prefix count by 2,600 prefixes per year (Figure 3). 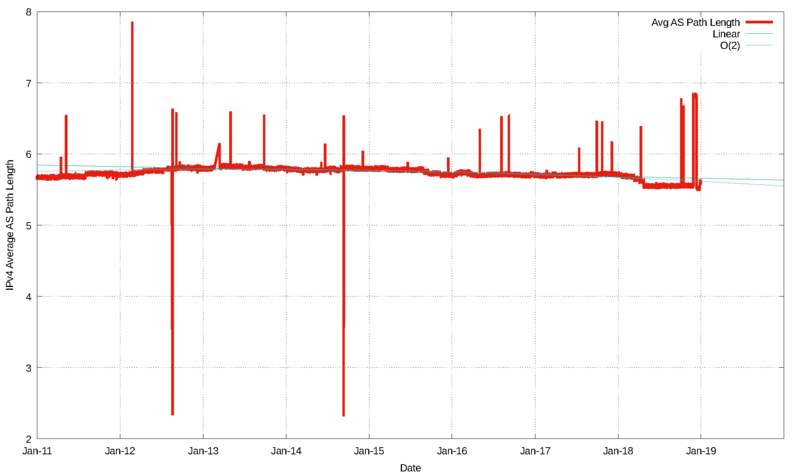 Figure 3 – IPv4 unstable prefixes per day – linear best fit. However, this increased count of the number of unstable prefixes and the increasing update count is not reflected in the measure of the time to reach a converged state. The average time for an unstable prefix to reach stability is still around 50 seconds (Figure 4), and while it rose in 2013 from around 40 to 50 seconds, the number has remained at 50 seconds since then. 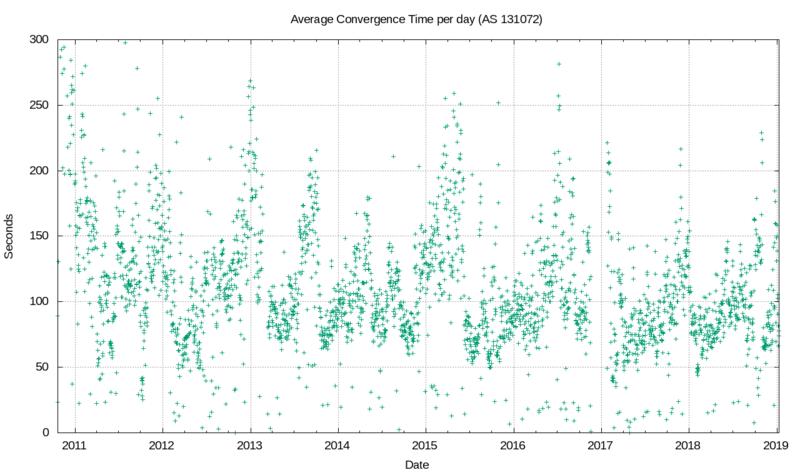 Figure 4 – IPv4 average routing convergence time per day. The instability in BGP is not uniform. 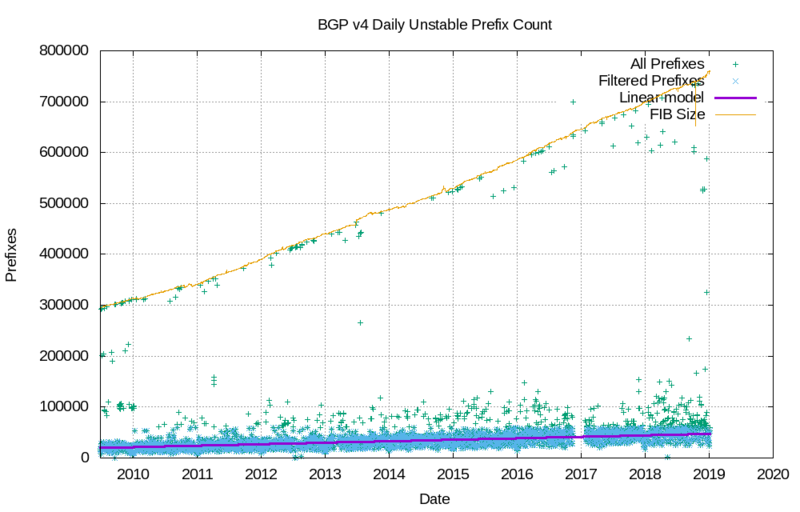 Half of all the BGP updates over a period of a week are attributed to less than 1% of the unstable prefixes, and just 50 origin ASNs accounted for one-half of all BGP IPv4 updates in the closing week of 2018. 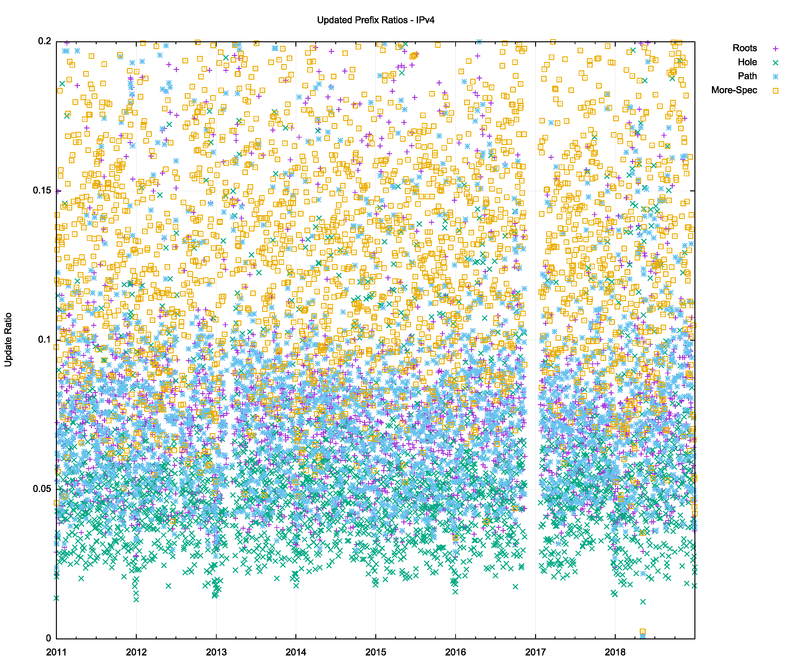 It appears that the network is generally highly stable and that a very small number of prefixes appear to be advertised across highly unstable BGP configurations over periods that extend for weeks rather than hours. The cumulative distribution of BGP updates by prefix and by origin AS, shown in Figures 5 and 6 for the final week of 2018, shows the highly skewed nature of unstable prefixes in the routing system. 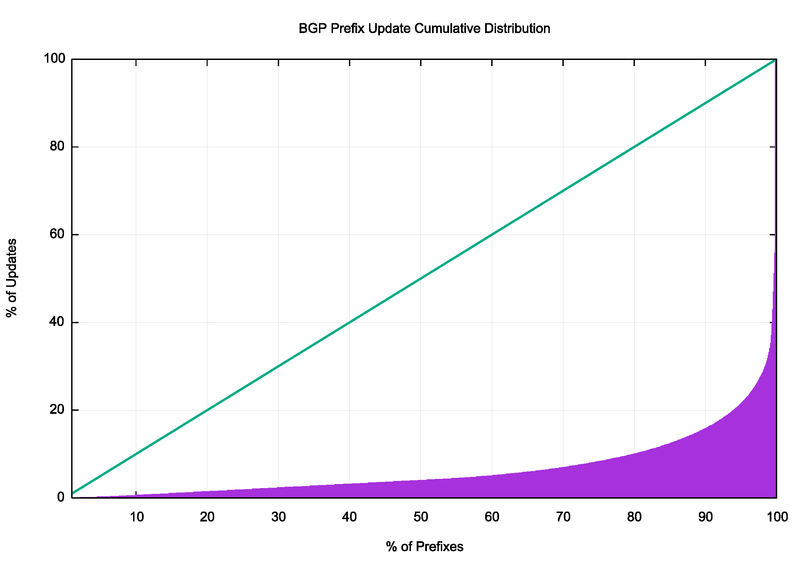 Figure 5 – Distribution of BGP updates by prefix. 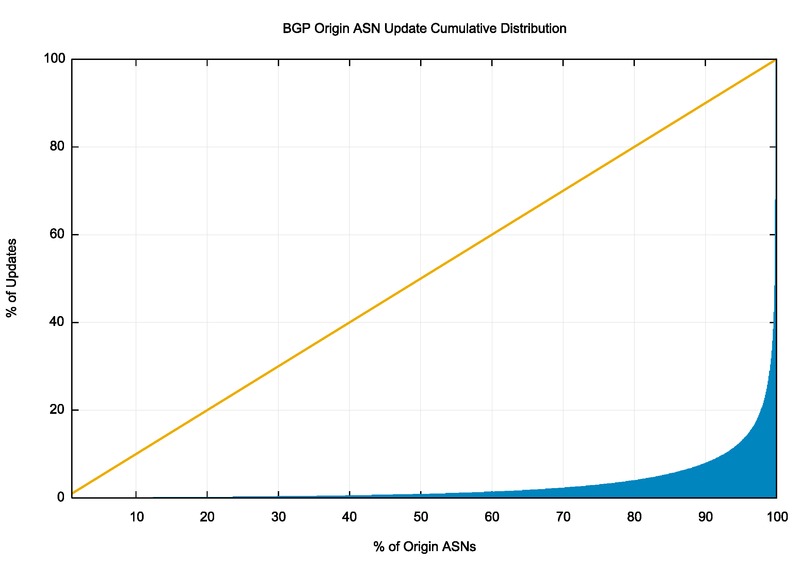 Figure 6 – Distribution of BGP updates by origin AS. Ideally, the IPv6 routing network should be behaving in a very similar manner to the IPv4 environment. It is a smaller network, but as the overlay IPv6 tunnels are phased out, the underlying connectivity for IPv6 should be essentially similar in terms of the connectivity of IPv4 (it would be unusual to see two networks where one provided transit services to the other in IPv4, yet the opposite arrangement is used for IPv6). So, given that the underlying topology should have strong elements of similarity across the two protocols, we should see the BGP stability profile of IPv6 appear to be much the same as IPv4. 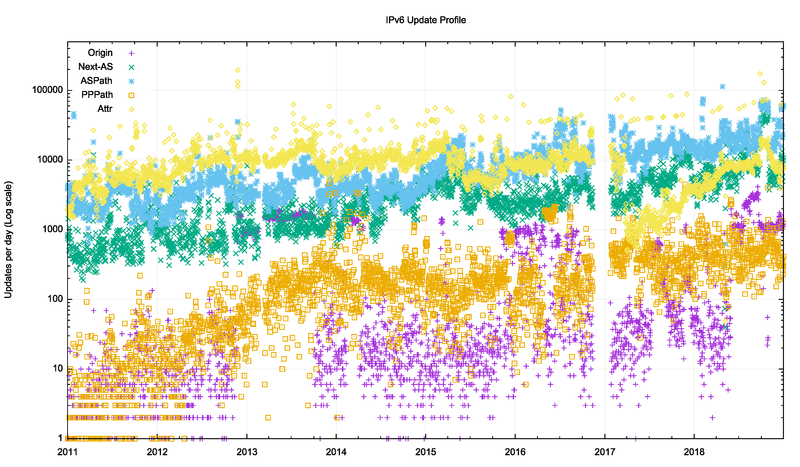 Figure 7 shows the profile of IPv6 updates since 2009. The number of withdrawals per day has been growing slowly across this period. 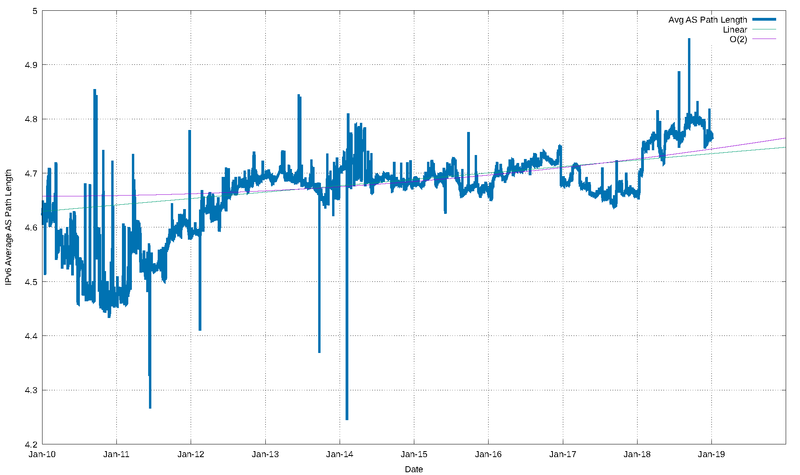 The profile of BGP updates per day is quite different from IPv4. 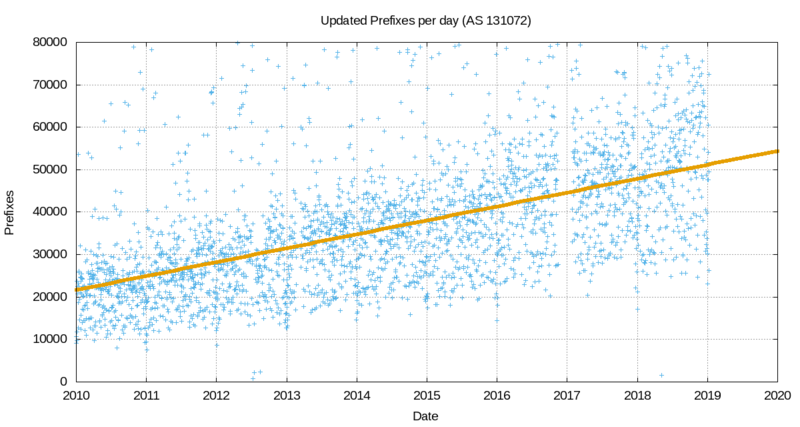 This number has been rising since 2015, and by the end of 2018, we are seeing some 35,000 updates per day with peaks of more than 100,000 updates per day. Figure 7 – IPv6 BGP update counts. Figure 8 shows that the number of unstable prefixes has risen at a rate that appears to be proportionate to the total prefix count, and now numbers around 5,000 unstable prefixes per day. Figure 8 – Unstable IPv6 prefix count. 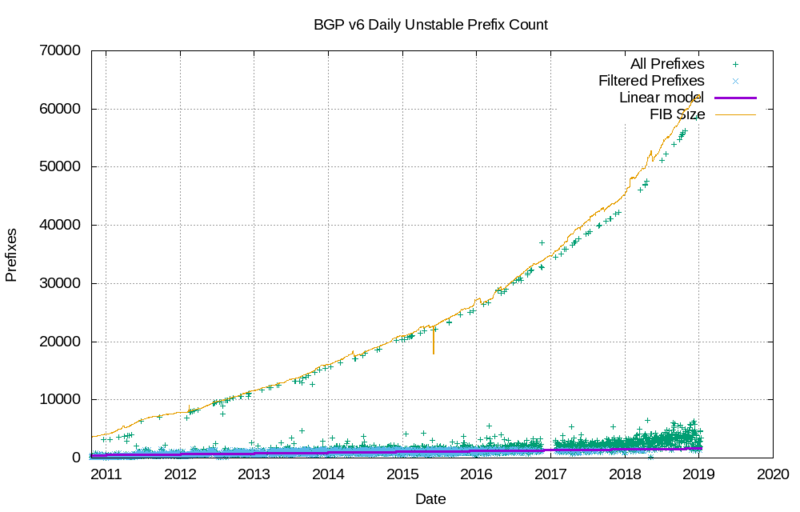 While the IPv6 BGP table size appears to be growing at an exponential rate, the number of unstable prefixes per day appears to be growing at a slower rate that appears to match a linear growth model (Figure 9). Figure 9 – Unstable IPv6 prefix count. 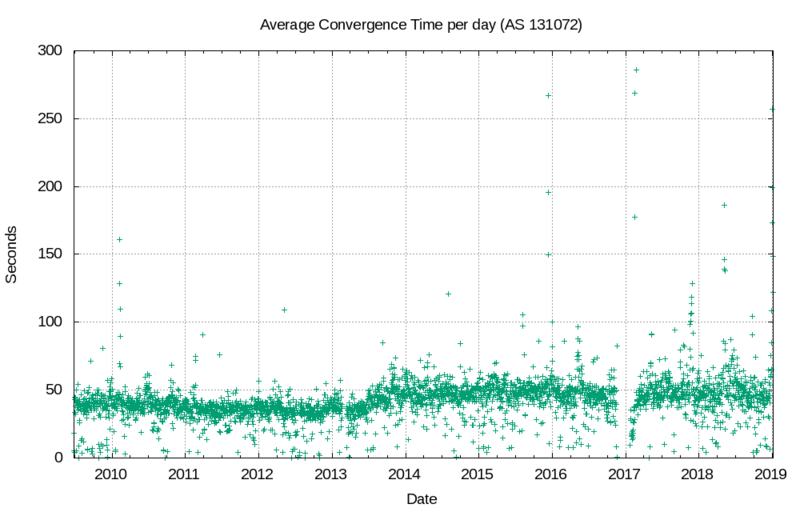 The average time to reach convergence has been unstable for the IPv6 network (Figure 10). The daily average of this convergence time ranges between 70 and 150 seconds. Figure 10 – IPv6 average routing convergence time per day. It is also evident that the distribution of updates across the set of announced prefixes and originating ASNs is far more skewed than IPv4. In the final two weeks of 2018, the most unstable 50 IPv6 prefixes accounted for some 40% of the total update volume, and the most unstable 50 origin ASNs accounted for some 70% of the updates. The distribution of updates is shown in Figures 11 and 12. 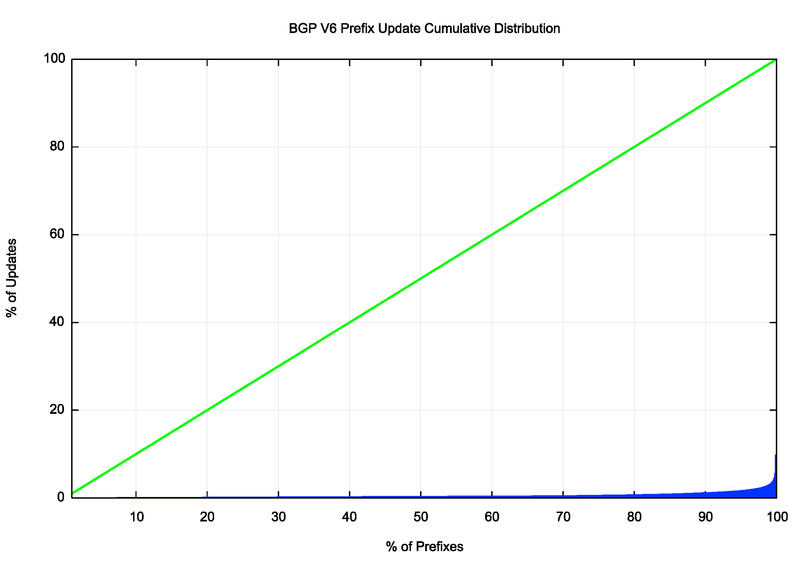 Figure 11 – Distribution of BGP IPv6 updates by prefix. Figure 12 – Distribution of BGP IPv6 updates by origin AS. It is not immediately obvious why IPv6 has this higher instability component than IPv4. A concern is that this instability remains a persistent condition as the IPv6 network continues to grow, which would create a routing environment that would impose a higher processing overhead than we had anticipated, with its attendant pressures on BGP processing capabilities in the network. BGP is a distance vector routing protocol that achieves a coordinated stable routing state through repeated iterations of a local update protocol. The efficiency of the protocol depends heavily on the underlying topology of the network. Highly clustered topologies, such as star-based topologies, will converge quickly, whereas arbitrary mesh-based topologies will generally take longer to converge to a stable state. The convergence behaviour of BGP, particularly in the IPv4 network is quite remarkable, and perhaps the best illustration of why this is the case lies in the average AS path length of the BGP routing table over time (Figure 13). Figure 13 – Average AS path length of BGP IPv4 prefixes. A related picture is shown in the distribution of AS adjacencies counts in the IPv4 network (Figure 14). 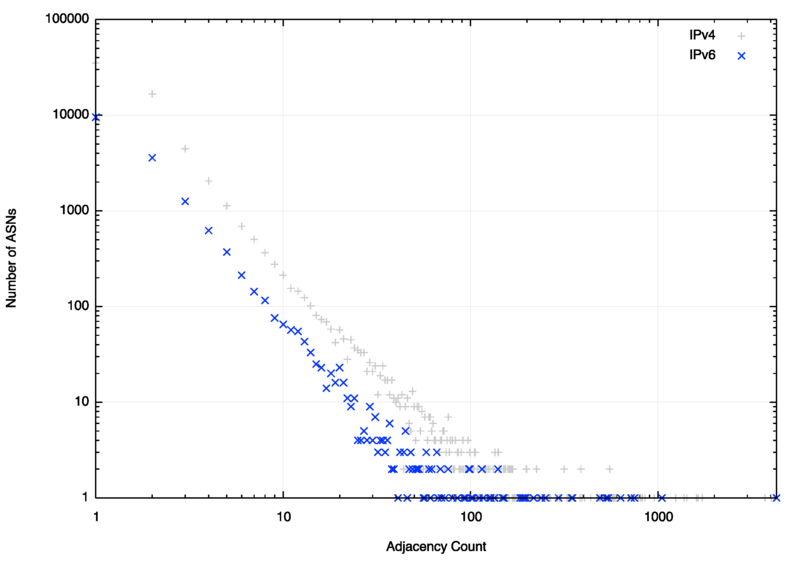 Only 14 networks have more than 100 AS adjacencies that are advertised the transit network. This is consistent with a network that is composed of a relatively small set of transit ‘connectors’ and a far larger set of stub networks that attach themselves into this core. Figure 14 – Distribution of AS adjacencies in the IPv4 network. 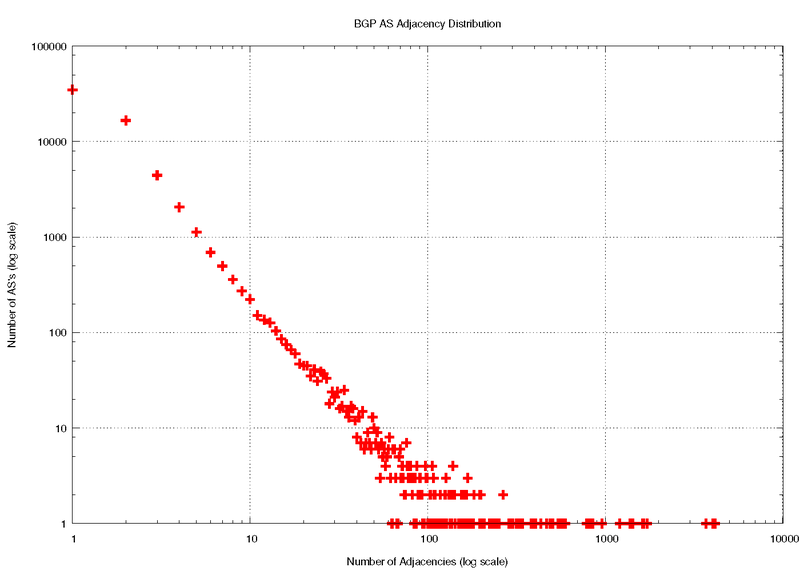 A similar picture exists in IPv6 (Figure 15) of a relatively stable average AS path length, and there is a similar picture of AS Adjacency distribution (Figure 16). In the case of IPv6, there are other factors that appear to influence the overall stability of IPv6. Figure 15 – Average AS path length of BGP IPv6 prefixes. Figure 16 – Distribution of AS adjacencies in the IPv6 network. These profiles of topology would support a conclusion that the IPv4 and IPv6 BGP system should behave in a reasonably similar manner, yet IPv6 is visibly less stable. However, the distributions of Figures 11 and 12 need to be remembered. 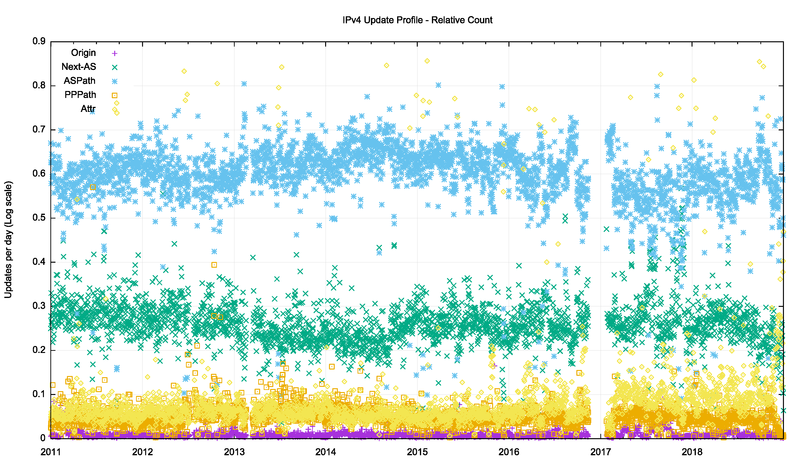 When we are talking average update volumes, we are actually talking about a very small set of prefixes that generate anomalously high numbers of updates. When we say ‘IPv6 is visibly less stable’, it is probably more accurate to say that ‘the small number of anomalously unstable prefixes in IPv6 exhibit relatively higher levels of instability than their IPv4 counterparts’. We can look further into these updates to see if there is any visible correlation between routing practices by network operators and BGP instability. If we look at just those updates that refine an already announced address prefix we can use a taxonomy of the effect of the routing update. The taxonomy used here is to look at a change in the origin AS, a change in the next-hop AS (the next AS in the AS path that is adjacent to the origin AS), a change in the AS prepending of the AS path, any other changes in the AS path, and finally a change in the non-AS path attributes of the update. The profile of the daily count of these updates is shown in Figure 17 for IPv4 and Figure 18 for IPv6. Figure 17 – Distribution of update types in the IPv4 network. Figure 18 – Distribution of update types in the IPv6 network. 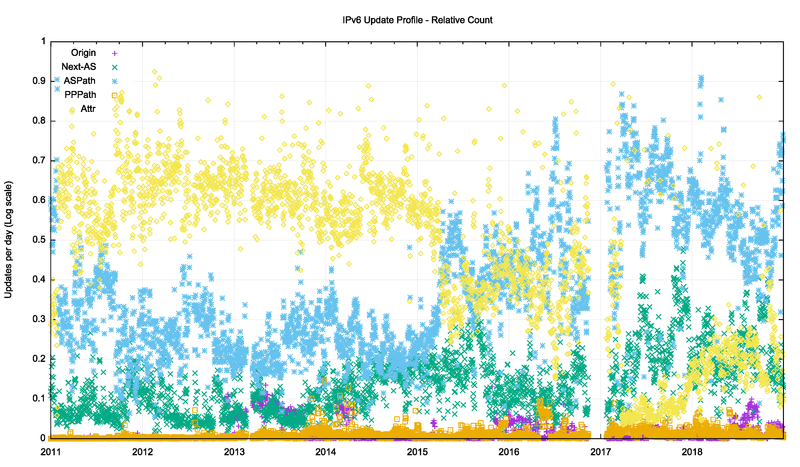 Another way of looking at this data is to remove the absolute volume of updates and look at the update types as a proportion of the total number of updates seen each day (Figures 19 and 20). Figure 19 – Relative distribution of update types in the IPv4 network. Figure 20 – Relative distribution of update types in the IPv6 network. In IPv4, most (60%) of the BGP updates describe changes in the BGP path. Slightly less than 30% of the changes occur at the origin AS and its selection of the next-hop AS. Changes in the number of prepends in the AS path and changes in other attributes are less common (around 5% in both cases) and the smallest set of updates reflect changes in the origin AS. IPv6 is less stable in this respect. 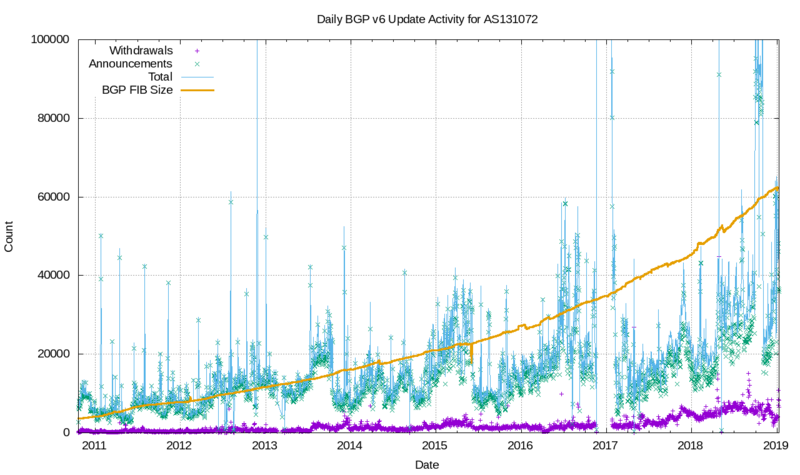 Attribute changes (updates that do not change the AS path) were the most prevalent form of BGP update in the period from 2011 to 2015, and while this dropped in 2017, it has been rising again in 2018. The IPv4 network exhibits a reasonable level of day-to-day stability. It is evident that updates that change the origin AS’s selection of its next-hop AS tend to be the most prevalent. A change in the AS sequence (a change to the AS path when the path is stripped of prepending) is the next most common form of BGP update. A change in the prepending of the AS path and a change in other BGP attributes appears to be equally common, while a change in the origin AS itself is the lest common form of an update. It is likely that much instability is due to BGP oscillation when negotiating routing policies relating to multiple paths. As a distributed algorithm, BGP itself is not a deterministic process. When the protocol is attempting to negotiate a stable outcome between the BGP preferences of BGP speakers announcing reachability across multiple egress paths, and BGP listeners applying local preferences across a number of ingress paths, then some level of instability is not unexpected. Indeed, what is perhaps most surprising here is that these BGP updates are so low, particularly when the underlying topology appears to show such a rich level of interconnection. When a BGP environment becomes unstable and flips between multiple local states that are all equivalent one might expect that the BGP update rate would increase uncontrollably. What mitigates this situation is BGP’s Minimal Route Advertisement Interval (MRAI) damping interval. BGP will only update an eBGP neighbour every MRAI second and only pass on the current state of each update prefix, damping out any form of local route oscillation. The commonly used value of 27–30 seconds (varied randomly each MRAI interval) is the most likely explanation of why BGP appears to be so well behaved in terms of update rates. The cost of this MRAI timer is reflected in the average time to route convergence, which is steady at 50 seconds in IPv4 (Figure 4) and varies between 50 and 250 seconds in IPv6 in a long-term oscillation with a period of some months (Figure 10). This is, of course, far longer than the 50ms ideal time to converge, which is commonly cited within the industry (although why the value of 50ms has been chosen is baffling, as there is no known justification for this particular value). From time to time the discussion takes place on reducing the MRAI timer value for all eBGP speakers. It would likely result in faster average convergence times, but what is not so clear is the relationship between MRAI timer settings and overall BGP update volumes. It is likely that the widespread use of a smaller MRAI timer in the eBGP environment would result in an increased volume of BGP updates. BGP is used for two functions. The first is the maintenance of the network’s interdomain topology. BGP ‘discovers’ the set of reachable networks through the conventional operation of a distance vector-style distributed routing protocol. It’s not that every BGP speaker assembles a complete map of the connected state of the network. BGP’s objective is slightly different, in that each BGP speaker maintains a list of all reachable address prefixes and for each prefix maintains a next hop forwarding decision that will pass a packet closer to its addressed destination. The second part of the use case can be more challenging. BGP is used to negotiate routing policies or so-called ‘traffic engineering’. If a network is connected to two upstream transit providers and one offers a lower price than the other, then the local network may well prefer to use the lower cost network for all outgoing traffic, all other things being equal. There is also the issue of incoming traffic that needs to be considered, so the local network operator would like to bias the route selection policies of all other networks such that the lower cost transit network is used to reach this local network. Outgoing traffic can be groomed to match local policies by using local policy settings in the interior routing space, but incoming traffic can only be ‘groomed’ by using BGP to bias other networks’ route selection policies. There are a number of ways of achieving this, but the basic observation is that if you wish to groom incoming traffic according to a number of different policy settings then you need to advertise a collection of address prefixes to be associated with each policy setting. The most common routing practice is to advertise the aggregate route set to all adjacent peers, and then selectively advertise more specific routes to some adjacent peers in order to implement these routing policies. What we would expect to see in this scenario is that the aggregate routes and the more specifics may well have differing AS paths, but they would share the same origin AS. A variant of this form of traffic engineering exploits the fact that the BGP route selection algorithm will prefer shorter AS paths when all other factors are equal. A BGP speaker may elect to artificially increase the AS-path length on the less preferred ingress path by adding repetitions of its own AS to the AS path to the less preferred eBGP peer. Any form of instability in path selection between these multiple ingress paths would be reflected as a set of updates that retain the same origin AS and even the same next-hop AS and retain the same sequence of AS’s in the AS path. However, the paths differ across successive updated in the amount of AS prepending contained with the path. A somewhat different scenario occurs when an end site uses an address prefix from a provider’s address block but wants to define a unique routing policy. In this case, the end site would use its own AS number, so that the aggregate and its more specific AS would use different origin AS numbers. It is also possible that the network operator is advertising more specific routes as a means of mitigating, to some small extent, the impacts of a hostile route hijack. In this case, the aggregate route and the more specific would share a common origin AS and a common AS path. We can look at the route table to see the prevalence of each of these types of advertised prefixes. Figure 21 shows the relative proportion of the prevalence of each of these four types of route advertisement: a ‘Root’ prefix which has no covering aggregate, a ‘Hole’ prefix where the origin AS of the more specific prefix differs from the origin AS of the covering aggregate, a ‘Path’ prefix where the more specific prefix shares the same origin AS, but has a different AS path, and a ‘More-Specific’ prefix where the AS path of the more specific and the covering aggregate are the same. Figure 21 – Relative distribution of prefix types in the IPv4 network. 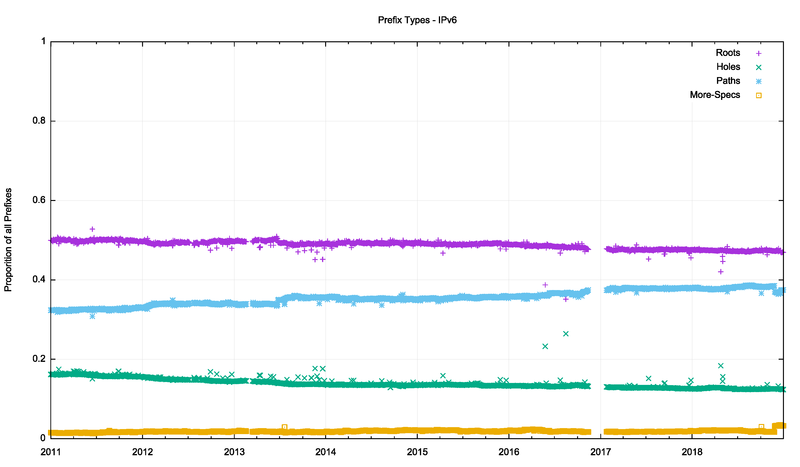 Over the past 7 years, the proportion of root prefixes has declined, as have hole prefixes, while the number of different path more-specific prefixes has risen. A comparable view of the IPv6 network (Figure 22) shows a similar picture but in a more exaggerated form. The relative incidence of root prefixes has declined from 80% to 60%, while the number of different path more-specific prefixes has risen from 10% to 30%. 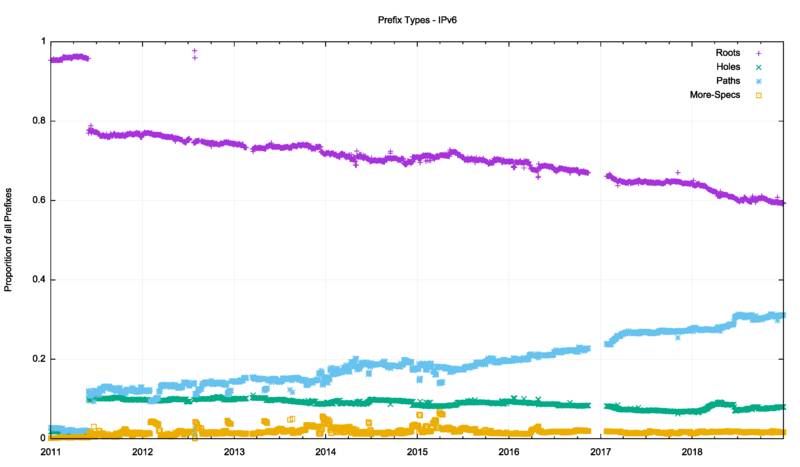 A possible explanation is that as IPv6 changes from being a low use trial to become part of the service environment considerations of traffic engineering rise in importance, and the number of different path more-specific reflects this changing perception of the role of the IPv6 network. Figure 22 – Relative distribution of prefix types in the IPv6 network. Is each of these prefix types equally likely to be the subject of BGP updates? Or are some prefix types more stable than others? An intuitive guess would see root prefixes being more stable than traffic engineering prefixes, as would the hole more specific prefixes. The other two types of more-specific prefixes should be more likely to be unstable. Figure 23 – Relative distribution of prefix update types in the IPv4 network. Figure 23 shows the day-to-day calculation of the relative proposition of BGP instability. It plots the number of updated prefixes per day of each prefix type, as compared to the total number of prefixes of that type. It is a relatively noisy picture, but some general trends are visible. More-specific prefixes that have the same AS path as their covering aggregate are more likely to be updated as compared to other prefix types. Root prefixes and more-specific prefixes with different AS paths appear to have a similar update ratio. Hole more-specifics (different origin AS) are the most stable of the prefixes in the IPv4 network. Figure 24 – Relative distribution of prefix update types in the IPv6 network. The same analysis has been applied to the IPv6 network (Figure 24). A similar picture is evident in the data, but the level of day-to-day variation is far more evident. None of the BGP churn metrics indicates that we are seeing such an explosive level of growth in the routing system that it will fundamentally alter the viability of carrying a full BGP routing table anytime soon. The BGP update activity is growing in both the IPv4 and IPv6 domains, but the growth levels are well below the growth in the number of routed prefixes. The ‘clustered’ nature of the Internet, where the diameter of the growing network is kept constant while the density of the network increases, as implied by the dynamic behaviour of BGP, as measured by the average time to reach convergence, has remained very stable in IPv4 and bounded by an upper limit in IPv6. The incidence of BGP updates appears to be largely unrelated to changes in the underlying model of reachability, and more related to the adjustment of BGP to match traffic engineering policy objectives. The growth rates of updates are not a source of any great concern at this point in time.